Like many (or all) application virtualization or layering solutions, not all applications can be layered / virtualized in a straightforward fashion. This is also true for VMware AppVolumes. To help customers with this VMware has started to provide 'recipes'. These recipes give IT guidelines on installing apps in AppStacks, so they can properly provision apps to target endpoints or users. The first recipe is for a classic enterprise app: Microsoft Office (365). The recipe provides instructions for planning, preparing and provisioning Office 365 within the AppStack. This guide does not cover all aspects of App Volumes deployment and configuration; it only covers aspects specific to Office 365 deployment in App Volumes environment. Important: Office 365 is currently available in two versions: Office 2013 and Office 2016. App Volumes 2.10 has been tested only with Office 2013. Office 2016 version of Office 365 may work; however, that version is not currently on the compatibility list. 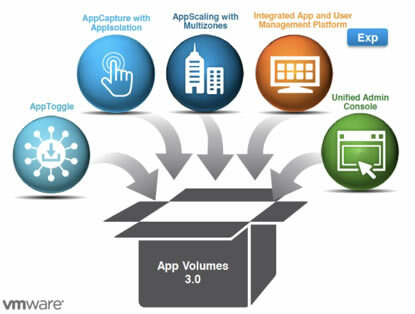 App Volumes 2.10 is the first version of App Volumes that is compatible with Office 365. If you have been using a previous version of App Volumes, make sure that all components, including the Manager, agents and templates are updated. You can access this recipe here:communities.vmware.com/docs/DOC-31399. VMware plans to build out this list of recipes and encourages community members to add on to this list as they see fit. Just go to communities.vmware.com/community/vmtn/appvolumes, post your recipe and VMware will take care of reviewing and posting it into the documents section.